This chapter is a synthesis of new knowledge, procedures, best practices and references for collecting plant diversity since the publication of the 1995 volume Collecting Plant Genetic Diversity: Technical Guidelines, edited by Luigi Guarino, V. Ramanatha Rao and Robert Reid, and published by CAB International on behalf of the International Plant Genetic Resources Institute (IPGRI) (now Bioversity International), the Food and Agriculture Organization of the United Nations (FAO), the World Conservation Union (IUCN) and the United Nations Environment Programme (UNEP). The original text for Chapter 20: Collecting and Handling Seeds in the Field, authored by R. D. Smith, has been made available online courtesy of CABI. The 2011 update of the Technical Guidelines, edited by L. Guarino, V. Ramanatha Rao and E. Goldberg, has been made available courtesy of Bioversity International. Appropriate handling of immature fruits can greatly improve seed quality for long-term storage. Seed banking remains a cornerstone in the conservation of plant genetic resources. To be successful, it relies on the collecting and banking of high-quality seeds. In 1995 there was relatively little guidance available to seed collectors (especially of wild plant species), who had to make decisions in the field about what to collect and how to handle collected material. Since then, research into various aspects of seed conservation has meant collectors should have a better idea of the storage behaviour and potential longevity of seeds of a target species and the likely maturity status of the collected seeds. Knowledge of the moisture status of the seeds, which can be quickly and easily determined in situ, and of the local climatic conditions, can help inform what to do with a collection immediately after harvest. A particular concern is that, while a relatively small proportion of species were known to have recalcitrant or intermediate seed storage behaviour, there may be many technically orthodox species whose seeds are so short-lived in conventional seed bank storage that alternative storage conditions or even methods of conservation will have to be sought. In the earlier version of this chapter, published in 1995, Roger Smith concluded that there was a scarcity of published data to aid collectors on the post-harvest handling of seeds. Shortly after that, Roger was responsible for leading the Millennium Seed Bank Project, the largest seed conservation effort for wild plant species ever undertaken. It is therefore no coincidence that a major thrust of research on seed storage behaviour, longevity, development and post-harvest handling began around that time. In 1995, we knew that the moisture status of seeds at the time of collection and during the post-harvest period would have a major impact on subsequent seed longevity. Historical climate data could be used to predict the likely affects on seed longevity if seeds were exposed to average ambient conditions in the field. However, portable and reliable means of directly measuring seed moisture status and ambient conditions in the field were not widely available at that time; they are now and are already used by seed collectors around the globe. Our knowledge of the relationship between seed maturity and the development of seed tolerance to desiccation and seed longevity is now also greatly improved, which has enabled the development of clear practical guidelines for post-harvest handling. We also have a much better understanding of the variation among species in inherent seed longevity and the factors that correlate with such differences. This good news, however, is tempered by the fact that we have now discovered wild plant species and crop relatives that are potentially extremely short lived using conventional techniques for seed conservation. The global threat to plant diversity from land conversion, invasive species and climate change means that it is now more important than ever to collect and conserve plant genetic resources. Armed with the knowledge gained and tools developed since 1995, collectors can be more confident that collections will reach the seed bank in prime condition. One of the first considerations when deciding how to collect and handle seeds of a particular species is storage behaviour. The Seed Information Database (SID) (http://data.kew.org/sid) began as an online version of the Compendium of Information on Seed Storage Behaviour (Hong et al. 1998), which categorized species as having recalcitrant, intermediate or orthodox seed storage behaviour based on published data and unpublished seed storage results from the Seed Bank of the Royal Botanic Gardens Kew. SID currently contains information on the seed storage behaviour of 19,676 species and can be searched at different levels of taxon (although not by common names). Most species for which information is available (93.9%) are described as having orthodox (or probably/likely orthodox) seed storage behaviour, although as observed previously, the species included in SID are probably biased towards temperate and/or useful plant species that might be more likely to have orthodox seed storage behaviour. Only 2.8% are described as having recalcitrant (or probably/likely recalcitrant) seed storage behaviour. The remaining species (0.8%) fall into the intermediate category of seed storage behaviour or have uncertain storage behaviour (based on the available data). Where information is not found in SID or through other literature or web searching, it may be necessary to empirically determine seed storage behaviour, if seeds, time and facilities are available. Hong and Ellis (1996) presented an experimental scheme to determine seed storage behaviour whereby seeds are dried to increasingly lower moisture contents and tested for germination; samples of those that survive drying to 10% moisture content are further dried and stored at -18°C for three months and then tested again. This scheme requires a large number of seeds. Pritchard et al. (2004) described a simpler version where small samples of seeds are used for moisture content and germination testing before and after drying; drying to equilibrium with silica gel is monitored by following the change in seed weight. These types of experiments on desiccation tolerance assume that appropriate dormancy-breaking treatments and germination requirements are known. This might not be the case, and for example, as reported for Carica papaya, dormancy can be induced by drying (Wood et al. 2000). Similarly, if the low temperature response as well as the desiccation response is tested, as in the Hong and Ellis (1996) schematic, it should be noted that the low temperature might reduce germination for reasons other than loss of viability, per se. Crane et al. (2003) found that there was reduced germination of seeds of some Cuphea species due to the crystallization of particular fatty acids within the seeds. Higher germination was achieved if the seeds were given a heat pulse to melt these lipids before imbibition (a response that cannot be described as the induction and release of dormancy). Recalcitrant seed storage behaviour is still expected to be more prevalent in the warm moist habitats of tropical and sub-tropical forests, compared with more arid areas, and these seeds tend to have particular characteristics: they are likely to be non-dormant, dispersed at a high seed moisture content (since they are metabolically active) and during the wettest months of the year, relatively large and likely to have relatively thin outer tissues (endocarp and testa) (Daws et al. 2005; Ellis et al. 2007; Berjak and Pammenter 2008). Daws et al. (2006) used these last two traits in a model that can be used to predict the likelihood of desiccation sensitivity. If there is a high probability of desiccation sensitivity, it would be unwise to make a large seed collection for conventional seed bank storage. The expected ‘hot spot’ of desiccation intolerance among aquatic species has not been entirely borne out. Hay et al. (2000) found that a considerable number (65) of aquatic plants native to the UK do produce seeds that could withstand desiccation; only nine species were described as having recalcitrant or intermediate storage behaviour based on levels of desiccation tolerance. Similarly, although less surprising, Tuckett et al. (2010) reported that seeds of aquatic species found in temporary pools of Western Australia have orthodox storage behaviour. The extent of desiccation tolerated by seeds of species that are classified as having recalcitrant storage behaviour varies. This has led to the theory of a continuum of seed storage behaviour (for a review see Berjak and Pammenter 2008), from highly recalcitrant species, whose seeds tolerate little or no desiccation, through to extremely orthodox species, whose seeds are highly desiccation tolerant and long lived. Desiccation tolerance can even vary between different seed lots within a species and between individual seeds within a seed lot. Daws et al. (2004) showed how the degree of desiccation tolerance varied between seed lots of the recalcitrant species Aesculus hippocastanum, depending on provenance within its European range; differences were attributed to enhanced development of the seeds in warmer environments. Similarly for tropical species, the level of ‘maturity’ of the seed at shedding may determine the level of desiccation tolerated (Berjak et al. 1993; Lin and Chen 1995). Between species it has been observed that the slower the rate of water loss, the greater the desiccation sensitivity (Berjak and Pammenter 2008). Berjak and Pammenter (2008) also gave practical advice for the conservation of recalcitrant seeds: seeds should be kept at their harvest (or shedding) moisture content and at the lowest temperature that does not incur chilling damage. Seeds of species from temperate regions may tolerate lower temperatures (0-5°C) than species from tropical regions. Provided that fungal growth can be controlled, recalcitrant seeds may remain viable under such conditions for several months to a year or two, at best. For long-term ex situ conservation, cryopreservation techniques, often of excised embryonic axes, remains the only option for desiccation-sensitive species, including those that have been termed ‘intermediate’ but which might also be considered, on the continuum of desiccation tolerance, as ‘minimally recalcitrant’. The timing of seed collection is important since seed quality increases late in seed development: during the desiccation stage after the attainment of mass maturity (maximum seed dry weight). (Note that for orthodox seeds borne in fleshy fruits, there may be limited loss of water from the developing seed.) Understanding the physiology and patterns of gene expression of this stage of seed development continues to be a focus of seed research (for a review see Angelovici et al. 2010). Seeds of many orthodox species acquire desiccation tolerance around the time of mass maturity, some time before the desiccation stage is completed and seeds, in the case of wild species, are dispersed. However, there are some seemingly orthodox species in which there is little or no desiccation phase before seed dispersal, and some individual seeds within a cohort that might be considered ready for collection (on the point of natural dispersal) might not be fully desiccation tolerant. This phenomenon has been observed in the spring-flowering herbaceous geophyte, Anemone nemorosa, where only 30% of the freshly harvested seeds survived drying for 21 days at 15% relative humidity (RH), 15°C (Ali et al. 2007). Desiccation tolerance increased during the first five days after harvest in seeds placed on agar at 20°C. This Anemone nemorosa data shows how seed maturity at harvest can vary between individual seeds. Hay et al. (2010) attempted to determine the sources of variability in seed maturity by following the development of a cohort of seeds of Trifolium ambiguum. They concluded that, for this species, seed-to-seed variability in the timing of the onset of germinability, desiccation tolerance and hardseededness, and in the gaining of seed longevity was inevitable. Seed collectors in the field, even when collecting from a crop species where there might be less variability in phenology and micro-environment between individual plants, are unlikely to be able to make a collection of seeds with completely uniform maturity. Attainment of maximum seed longevity in T. ambiguum was associated with a change in seed coat colour from orange to dark orange, although there were subsequent declines in potential longevity (Hay et al. 2010). A useful review of field markers of seed maturity, including changes in fruit and seed coat colour can be found in Hay and Smith (2003). Another potential marker of seed maturity is the amount of chlorophyll fluorescence emitted by the intact seeds since, for some species, the amount of chlorophyll in the seeds declines during seed development (Jalink et al. 1998). Whether such a technology could actually be of practical use on a seed-collecting expedition remains to be seen, but seed sorters that discriminate on the basis of either colour or chlorophyll fluorescence are available and could be used during the processing of seed accessions (Dell’Aquilla 2009). Moisture content is also commonly used to assess seed maturity. However, empirical determination of seed moisture content is a destructive test and obviously requires laboratory facilities. Probert (2003) described how portable instruments that determine the equilibrium relative humidity (eRH)—the RH of the air around a sample when the system is in equilibrium—of a seed sample can be used to decide whether it is appropriate to make a collection or, if a collection is made, how the seeds should be processed. The use of digital hygrometers and alternatives for measuring seed moisture status has been described in more detail by Probert et al. (2003). These methods and practical guidelines for post-harvest handling of seeds (see below) are also covered by Millennium Seed Bank information sheets 04, 05, and 07 (www.kew.org/msbp/scitech/publications/info_sheets.htm). In dry climates, if the eRH of a sample of seeds is already close to ambient RH, seeds should be collected as soon as possible. If fruits/seeds do not easily detach from the maternal plant and the eRH of the seeds is still high (85%–100%), it is better to wait for further maturation before making a collection. How seeds are handled immediately after harvest is critical to their subsequent longevity in storage. Particular care should be taken when a species’ seeds are expected to be extremely short-lived (see below). The timing of seed collection is also important; however, it might not always be possible to wait to collect seeds on the point of natural dispersal (as recommended for seeds of wild species) because of logistical constraints. If fruits/seeds have a very high eRH at harvest (85%–100%) and if resources are available to create a controlled, non-desiccating environment, they should not be rapidly dried. Seed quality is likely to increase if such seeds are held under conditions (temperature, humidity) that are close to the conditions that they would experience if they remained on the maternal plant (Probert et al. 2007). As a general rule, suitable conditions to aim for would be ~75% RH and close to ambient temperature. During a collecting expedition, it might be more practical to simply hold intact fruits under shaded ambient conditions to allow continued ripening (table 20.1). Butler et al. (2009) found that if seeds are collected before the end of the desiccation phase of seed development and dried, developmental processes leading to increases in seed quality might be resumed if seeds are later placed at high humidity. This may be worth considering in situations where it has not been possible to hold seeds at high humidity immediately after harvest, although it needs validating for more species before it might be considered appropriate for routine use. Hold intact fruits under shaded ambient conditions for 1-2 weeks for continued ripening. Dry in a thin layer, in a well-ventilated location. Minimise moisture absorption at night. Transfer to seed bank as soon as possible or dry with a desiccant such as silica gel or place in an air-conditioned room. Hold in loosely packed mesh or paper bags in a well-ventilated, shaded location. Minimize moisture absorption at night. Note: For more details, see MSBP technical information sheets 04 and 05 (www.kew.org/msbp/scitech/publications/info_sheets.htm). If the eRH of collected seeds is between 50% and 85%, the rate of aging is likely to be unacceptable. If the ambient conditions are also hot and humid, it will be necessary to dry the seeds as soon as possible using a desiccant and/or transfer the seeds to an air-conditioned or purpose-built dry room. In less humid climates, the seeds can be dried by placing them in a thin layer in a well-ventilated, shaded location. Seeds should not be allowed to take up moisture overnight when ambient air humidity increases. This can be prevented by sealing them in air-tight containers. For seeds that are already relatively dry at the time of collection, the advice is similar except that in dry climates, the seeds can be loosely packed in mesh or paper bags and kept in a ventilated location (table 20.1). The eRH of fleshy fruits is likely to be high regardless of the maturity stage of the seeds inside, and there is little point in measuring the eRH of these fruits. 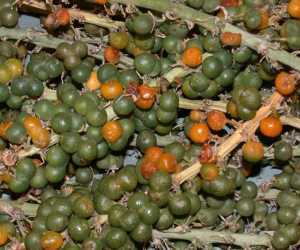 Seeds from such fruits should be extracted as soon as physical signs (such as fruit colour) suggest that the fruits are ripe. Unripe fruits should be kept under ambient conditions and direct sunlight may not be unfavourable. Simulating natural conditions, extracted seeds should also be allowed to dry relatively slowly (i.e., aiming for the ~75% RH as above) before being transferred to the genebank dry room. Even if a species falls into the orthodox category of seed storage behaviour in that the seeds are desiccation tolerant, it does not mean that conventional seed bank storage is an appropriate method of ex situ conservation. There is increasing evidence that the seeds of some wild species are extremely short-lived in air-dry storage. For example, seeds of Anemone nemorosa are predicted to survive only a year or two at most under conventional seed bank conditions (Ali et al. 2007). This finding is consistent with those of Probert et al. (2009), who found that relatively short seed longevity in air-dry storage was correlated with the presence of endosperm and with cool, wet environments. Walters et al. (2005) similarly found taxonomic and climatic trends in relation to seed longevity among accessions (breeding lines, landraces, and wild populations) comprising 276 species, including many common crops, and Mondoni et al. (2011) have recently shown that seeds of Alpine plants were significantly shorter lived than related species and ecotypes from nearby lowland habitats. If collected seeds are expected to be very short-lived in air-dry storage, care is needed to ensure that viability is not lost before seeds arrive at the seed bank (see table 20.1). Li and Pritchard (2009) have suggested that it makes economic sense to use ultra-cold storage (in or above liquid nitrogen) for short-lived (indeed all) orthodox seeds, particularly for threatened and vulnerable wild species. At the extreme end of the orthodox scale, Probert et al. (2009) found that seeds from some Australian species were particularly long-lived, and Sallon et al. (2008) have reported germination of date seeds (Phoenix dactylifera L.) that were carbon dated to be about 2000 years old. Delays in the processing of such seeds would be less detrimental than for short-lived seeds, although best practice should nonetheless be followed. The Ellis and Roberts (1980) improved viability equation remains a useful tool for predicting seed longevity in air-dry storage and also the potential losses that might be incurred if processing (drying and storage) is delayed, if the ‘viability constants’ have been determined for the species of interest. SID has a useful module that can be used to predict viability loss for species for which the viability constants of the equation have been determined. Currently, constants for 56 species are available in the database, including common cereal and legume crops as well as wild species. Constants for other species may be available in the literature, and the values can be entered within the seed-viability constants module of SID to make predictions. The module also allows the user to estimate equilibrium moisture content if the seed oil content for the species is known. Determining species viability constants for other species is relatively simple if the Dickie et al. (1990) universal values are used for the temperature constants, requiring experimental storage of seed samples to be carried out using a range of moisture contents at a single temperature (cf. a range of moisture contents and temperatures). The process of seed collecting always sounds as if it should be quite straightforward. However, in truth, if the seeds are to be of value as a genetic resource, we know that considerable care is needed in terms of deciding when and whether to collect and how to handle the seeds in the field. Collectors would still benefit from the development of fast, reliable tools for use in the field to diagnose seed storage behaviour, maturity stage, and perhaps, for orthodox seeds, potential longevity. Portable systems for efficient drying of seeds during a collecting trip or, if appropriate the converse, for holding them at high humidity, also need to be improved. More research is needed on potentially difficult and understudied groups: for example, temperate woodland geophytes, aquatic species and alpine species, whose seeds might be desiccation tolerant but very short-lived in conventional seed bank storage. Such studies might consider optimum time to collect, appropriate drying environments, treatments to overcome germination problems and dormancy, and alternative storage conditions. Non-orthodox seeds still present considerable challenges, not least since a wide variety of species, including some important crops and/or their wild relatives, have seeds that are non-orthodox. Key points restated and updated. Attempt to collect equal numbers of seeds from each plant sampled at the time of natural seed dispersal. Do not collect from the ground unless you can be sure seeds have only recently dispersed. Avoid damaged seeds (mechanical damage, pest attack). If seeds must be cleaned during the trip, do so by hand to minimize the chance of mechanical damage. Plan your activities so that no more than one month elapses between collecting and reception by the seed bank. If it is possible to avoid quarantine seed treatments without breaking quarantine regulations (for example through post-entry quarantine), do so. Personally ensure that seed arrives at the seed bank without undue delay. International air-freight companies offer a reliable service for sending seed batches around the world. Major companies provide online tracking services, and packages travel in pressurized, temperature-controlled aircraft cabins so there is little risk to seed quality during transit. Keep seeds aerated and moist in inflated polythene bags, changing the air at least weekly by deflation and re-inflation. Do not allow such seeds collected in the tropics to either cool below 20°C or heat up above ambient shade temperatures in the field or during transport. Make direct measurements of seed moisture status and ambient conditions at the time of collection using a suitable hygrometer to assess the risk of significant loss in seed viability during transit. Use the results to inform post-harvest handling decisions (table 20.1). For fleshy-fruited species, if logistically possible consider field cleaning of fully ripe fruits followed by shade (slow) drying of extracted seeds for three days or more (larger seeds need longer) to reduce the seed moisture content towards equilibrium with ambient relative humidity before packing. If the fruits are not fully ripe, then keep the fruits intact and aerated, at ambient temperatures. For fruits that are dry dehiscent or indehiscent, it is usually preferable to keep the fruits intact and aerated, at ambient temperatures. However, to use space more efficiently, seeds could be extracted by hand and dried in the shade as above. Collections containing a significant proportion of immature seeds or fruits should be allowed to continue ripening under ambient conditions but protected from exposure to direct sunlight. Such collections should be regularly checked for physical indications of improved maturity. If the collection comprises morphologically distinct maturity stages, consideration should be given to splitting the collection and treating the immature and mature seeds differently. Ali N, Probert R, Hay F, Davies H, Stuppy W. 2007. Post-dispersal embryo growth and acquisition of desiccation tolerance in Anemone nemorosa L. seeds. Seed Science Research 17:155–163. Angelovici R, Galili G, Fernie AR, Fait A. 2010. Seed desiccation: a bridge between maturation and germination. Trends in Plant Science 15:211–218. Berjak P, Pammenter NW. 2008. From Avicennia to Zizania: seed recalcitrance in perspective. Annals of Botany 101:213–228. Berjak P, Vertucci CW, Pammenter NW. 1993. Effects of developmental status and dehydration rate on characteristics of water and desiccation sensitivity in recalcitrant seeds of Camellia sinensis. Seed Science Research 3: 155–166. Butler LH, Hay FR, Ellis RH, Smith RD. 2009. Post-abscission pre-dispersal seeds of Digitalis purpurea L. remain in a developmental state that is not terminated by desiccation ex planta. Annals of Botany 103:785–794. Crane J, Miller AL, van Roekel JW, Walters C. 2003. Triacylglycerols determine the unusual storage physiology of Cuphea seed. Planta 217:699–708. Daws MI, Garwood NC, Pritchard HW. 2005. Traits of recalcitrant seeds in a semi-deciduous tropical forest in Panamá: some ecological implications. Functional Ecology 19:874–885. Daws MI, Garwood NC, Pritchard HW. 2006. Prediction of desiccation sensitivity in seeds of woody species: a probabilistic model based on two seed traits and 104 species. Annals of Botany 97:667–674. Daws MI, Lydall E, Chmielarz P, Leprince O, Matthews S, Thanos CA, Pritchard JW. 2004. Developmental heat sum influences recalcitrant seed traits in Aesculus hippocastanum across Europe. New Phytologist 162:157–166. Dell’Aquila A. 2009. Development of novel techniques in conditioning, testing and sorting seed physiological quality. Seed Science & Technology 37:608–624. Dickie JB, Ellis RH, Kraak HL, Ryder K, Tompsett PB. 1990. Temperature and seed storage longevity. Annals of Botany 65:197–204. Ellis RH, Roberts EH. 1980. Improved equations for the prediction of seed longevity. Annals of Botany 45:13–30. Ellis RH, Mai-Hong T, Hong TD, Tan TT, Xuan-Chuong ND, Hung LQ, Ngoc-Tam B, Le-Tam VT. 2007. Comparative analysis by protocol and key of seed storage behaviour of sixty Vietnamese tree species. Seed Science & Technology 35:460–476. Hay FR, Smith RD. 2003. Seed maturity: when to collect seeds from wild plants. In: Smith RD, Dickie JB, Linington SH, Pritchard HW, Probert RJ, editors. Seed Conservation: Turning Science into Practice. Royal Botanic Gardens, Kew, UK. pp. 97–133. Hay F, Probert R, Marro J, Dawson M. 2000. Towards the ex situ conservation of aquatic angiosperms: a review of seed storage behaviour. In: Black M, Bradford KJ, Vázquez-Ramos J, editors. Seed Biology: Advances and Applications. CAB International, Wallingford, UK. pp. 161–177. Hay FR, Smith RD, Ellis RH, Butler LH. 2010. Developmental changes in the germinability, desiccation tolerance, hardseededness, and longevity of individual seeds of Trifolium ambiguum. Annals of Botany 105:1035–1052. Hong TD, Ellis RH. 1996. A Protocol to Determine Seed Storage Behaviour. IPGRI Technical Bulletin No. 1. IPGRI, Rome. Hong TD, Linington SH, Ellis RH. 1998. Compendium of Information on Seed Storage Behaviour, Volumes I and II. Royal Botanic Gardens, Kew, UK. Jalink H, van der Schoor R, Frandas A, van Pijlen, Bino RJ. 1998. Chlorophyll fluorescence of Brassica oleracea seeds as a non-destructive marker for seed maturity and seed performance. Seed Science Research 8:437–443. Li D-Z, Pritchard HW. 2009. The science and economics of ex situ plant conservation. Trends in Plant Science 14:614–621. Lin TP, Chen M-H. 1995. Biochemical characteristics associated with the development of the desiccation-sensitive seeds of Machilus thunbergii Sieb. & Zucc. Annals of Botany 76:381–387. Mondoni A, Probert RJ, Rossi G, Vegini E, Hay FR. 2011. Seeds of alpine plants are short lived: implications for long-term conservation. Annals of Botany 107:171–179. Pritchard HW, Wood CB, Hodges S, Vautier HJ. 2004. 100-seed test for desiccation tolerance and germination: a case study on eight tropical palm species. Seed Science & Technology 32:393–403. Probert RJ. 2003. Seed viability under ambient conditions, and the importance of drying. In: Smith RD, Dickie JB, Linington SH, Pritchard HW, Probert RJ, editors. Seed Conservation: Turning Science into Practice. Royal Botanic Gardens, Kew, UK. pp. 337–365. Probert RJ, Daws MI, Hay FR. 2009. Ecological correlates of ex situ seed longevity: a comparative study on 195 species. Annals of Botany 104:57–69. Probert RJ, Manger KR, Adams J. 2003. Non-destructive measurement of seed moisture, In: Smith RD, Dickie JB, Linington SH, Pritchard HW, Probert RJ, editors. Seed Conservation: Turning Science into Practice. Royal Botanic Gardens, Kew, UK. pp. 367–387. Probert R, Adams J, Coneybeer J, Crawford A, Hay F. 2007. Seed quality for conservation is critically affected by pre-storage factors. Australian Journal of Botany 55:326–355. Sallon S, Solowey E, Cohen Y, Korchinsky R, Egli M, Woodhatch I, Simchoni O, Kislev M. 2008. Germination, genetics, and growth of an ancient date seed. Science 320:1464. Tuckett RE, Merritt DJ, Hay FR, Hopper SD, Dixon KW. 2010. Comparative longevity and low-temperature storage of seeds of Hydatellaceae and temporary pool species of south-west Australia. Australian Journal of Botany 58:327–334. Walters C, Wheeler LM, Grotenhuis JM. 2005. Longevity of seeds stored in a genebank: species characteristics. Seed Science Research 15:1–20. Wood CB, Pritchard HW, Amritiphale D. 2000. Desiccation-induced dormancy in papaya (Carica papaya L.) seeds is alleviated by heat shock. Seed Science Research 10:135–145.